Help Alice become the queen! Who would have thought that an old family mirror from London would open a portal to an incredible chess kingdom? Set off on an exciting adventure through the looking glass alongside famous characters from Lewis Carroll’s world-renowned fairytale. Assemble patchwork mosaics and help Alice become the queen of the world beyond the looking glass! 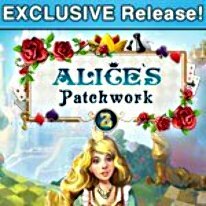 Alice’s Patchwork 2 is a game of mosaic puzzles made of 6 different materials: wood, cloth, glass, paper, precious stones and metal. Assemble patchwork puzzles and guess the picture: a garden with talking flowers, a crazy tea party, cards come to life, the riddles of Humpty Dumpty, a duel between the Lion and the Unicorn, the intrigues of the Red Queen, a meeting with the White Rabbit… What other wonders await you in these 6 worlds? Put together all the mosaics and help Alice transform from a pawn into a queen! - Our favorite heroes from the looking glass are here again! - Entertaining gameplay for players of all ages.